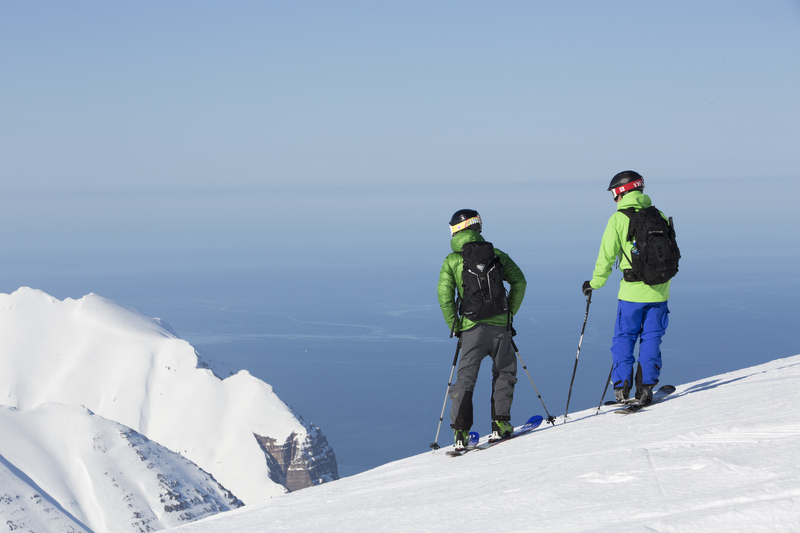 Get ready for a ski touring adventure of a lifetime. A tour directly from the town of Ólafsfjörður, where our lodgings are, up to Mulakolla (970m) and Kerahnjukur (1097m). Hard work but the rewards are with it with magnificent views east down to Fjord Eyjafjörður. A 30 minute drive north west to the small fishing village of Siglufjordur followed by a tour up Steinneshnjukur (857m) and Pallahnjukur (861m). The scenery is spectacular looking directly across the North Atlantic Ocean. A 30 minute drive south will take us to the town of Dalvik on the western shore of Eyjafjörður, the longest fjord in Iceland. You can see across to the island of Hrísey often referred to as “The Pearl of Eyjafjörður”. From Dalvik we can tour up to the top of Dagrihnjukur (1048). Head east and take a ferry across the Fjord to Grenivik and that opens up some more peaks. An option is to get a heli drop on the top of Stapar (1397) , skiing the east side, then skinning up Heidingi (1402m) before skiing back out to the heli ski centre. Note: Itinerary can change from day to day depending on weather, snow conditions along with group fitness and ability.